Property 3: $40K in Renovations; Concrete Between Floors AND Suites. Property 9: New loft garage suite close to Whyte Ave & University. Quick access to Downtown. Gorgeous and Spacious Condo in a Concrete Highrise in Oliver (Downtown)! Property 11: Gorgeous and Spacious Condo in a Concrete Highrise in Oliver (Downtown)! 6 bedrooms and your own private indoor pool, spa, sauna & gym! Property 19: 6 bedrooms and your own private indoor pool, spa, sauna & gym! Property 26: Nice Furnished And Clean Basement Apartment! Property 27: Downtown Highrise, Great Location! 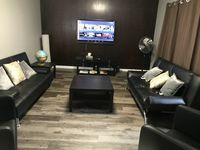 Executive Fully Furnished near West Edmonton Mall - Ready for you! Property 33: Executive Fully Furnished near West Edmonton Mall - Ready for you! Gorgeous Downtown Sunset Views! Minutes Away From So Much, Yet Nice And Quiet! Property 35: Gorgeous Downtown Sunset Views! Minutes Away From So Much, Yet Nice And Quiet!